I'm thrilled! I actually completed a sewing project. These are the pillows--now covered that Sara requested. Last week I had a photo of the fabric up for Creative Space, not sure if I would find the time to make them. I forget that there are projects that can be made quickly this is one of them. 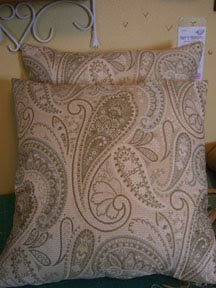 Now I'm thinking about recovering a few of my own pillows...thinking because I have so much stuff in my sewing room that needs to be done. Anyone else like that? If I don't get the t-shirts and skirts made I won't get to wear them this year. I'm with you... Last summer Hancock Fabrics went out of business and I got some really good deals on fabric and patterns. It's all waiting for me to have time to make something. wow! What a great looking blog. Maybe you can give me some tips?I would love it! Thanks for commenting and will exhange links with you for sure!